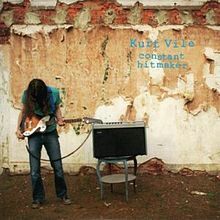 Kurt Vile – Constant Hitmaker – But Is It Any Good? OTHER SONGS YOU MAY KNOW: Freeway may have gotten some College Radio play. LINEUP: Kurt Vile, Adam Granduciel (at times). WHAT’S IT ALL ABOUT: Home recordings mixed with a couple of studio cuts for a singer / songwriter who was a founding member of The War on Drugs. SOME WORDS, PHRASES AND CLAUSES ABOUT THIS RECORD: Vile’s debut as a solo artist is a bit eclectic, in terms of content and recording quality. Some of the songs are a slog because of the recordings. Also, some of the recordings are just noise and tone experiments. However, Vile definitely shows his songwriting chops. What’s great about the modern era of recording is that you can definitely get your stuff out there. If it’s good, no matter what, people will find it. Also, if you don’t like something, you can yank it from your playlist. That’s what I’ll do with some of this – I appreciate DIY but like some other records I reviewed I need to hear what’s going on and the noise makes it hard to do so. NOTES & MINUTIAE: Vile formed the War on Drugs with Granduciel. He left amicably right when this album was being released as he preferred doing his own thing. GRADE: B: The good stuff is really good. Some of it is exiled. But you should see what suits your fancy!